Thanks, the price was right and certainly did the job. Much appreciated! Hi, First order for this year and so happy to see you're still in business. Fastest and cheapest printer ink delivered I've ever come across. Epson 29XL Value Pack at one third the price of Officeworks. I really cant get my head around the huge price difference. It's my second lot that I bought and they work superbly. I can't see much difference in print quality and they last a long time. Somebody should do something about these companies that are charging such ridiculous prices. Hey it's only printer ink for goodness sake. Well done Ink Hub ! Made a phone call, provided credit card details and delivery information. My cartridges arrived early next day. Excellent service. These are the best priced Epson 29XL cartridges I have found so far. They produce a good photo and the colours seem to be close to the Epson genuine inks that came with my Epson XP-432 printer. 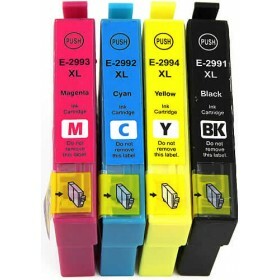 I recommend these cartridges as they are so much cheaper than the Epson ones. I first purchased these several months ago and they didn't work. I called Ink Hub and they explained why they didn't and offered to send me the newer ones which apparently would work. I was sceptical and a bit annoyed however upon receiving the new batch of cartridges they worked without fault. I am very impressed with their business ethics as I was expecting to just get fogged off like most other companies do. Glad to see a company that actually has some ethics. Well done ! Great product, tired of being ripped off for cartridges. These ones are the price they should be. Good stuff. Bargain price, fast delivery and they work fine. Print quality is same as Epson brand inks. Finally Epson cartridges for a realistic price! I am so angry at Epson for charging what they do for their replacement cartridges. These generic ones work perfectly at a fraction of the price. Thank you Ink Hub for great prices and service. I purchased some 29xl cartridges from Ebay and they wouldn't work in my Epson printer, no matter what I tried they just couldn't be recognised by the printer. In desperation I stumbled across an article on this website concerning Epson inks not being recognised. I bought the Epson 29xl inks (Generic) from Ink Hub and they work! The Epson 29XL Printer Cartridges are manufactured to the very highest ISO 9001 and ISO 14001 quality standards. Unlike the majority of generic cartridges on the market today which either leak, don't fit, clog up your print head or simply wont work at all our cartridges have the lowest failure rate of any non genuine cartridge available today. This is a very bold statement however after testing every brand of printer cartridge on the market since 2007 we are convinced that ours are the best, most reliable that there is. The way in which we gauge the reliability of any cartridge is by the failure rate. The failure rate of our non genuine inks are the same as that of a genuine OEM cartridge. That's right the failure rate of our generic cartridges is the SAME as the genuine OEM products ! Will the Epson 29XL cartridges work in my printer? This is the question that is often asked by our customers. The answer is a definite YES. We guarantee that these will work exactly the same as the genuine Epson 29XL Value Pack cartridges do and will provide the same or greater page yield at a fraction of the cost. If for any reason you are not 100% happy with the cartridges then simply call us for a FULL REFUND. How come the Epson cartridges I bought on Ebay don't work? There are numerous reasons as to why cartridges purchased on Ebay don't work. Are they the latest updated microchip version? Are they the correct Australia region chip or are they an overseas Ebayer who sold you cartridges from another region. Are the cartridges simply a low grade product that isn't molded correctly which in turn stops the cartridge from actually working correctly. Also was the viscosity of the ink of a low grade and it caused the print head nozzles to clog? Be warned that if you buy a generic cartridge on Ebay then any of the above issue can occur. Sure the price may be very low but who cares if either the cartridges wont work or worse still they destroy your printer. Rubbish, there is no such thing as a printer which wont work with non genuine cartridges. Sure as stated above there are multiple reasons as to why numerous generic cartridges simply will not work however we guarantee that ours WILL. In the unlikely event that they don't then you get a FULL REFUND. Will your Epson generic cartridges damage my printer? In over 10 years of dealing with generic cartridges I am yet to hear of a printer being damaged by our cartridges. This is due to the tight quality control measures which we place on our generic products. We personally believe that our cartridges are second to none. I have said this many times and I will state it again that even the biggest generic brand names out there today are NOT up to the same quality level that we demand from our brand of non genuine cartridges. I have tested over and over again the various brands of generic cartridges available and nothing has the quality of the cartridges we sell.